Prepare the mangoes by washing them free of any resin and slicing off a small section where the stem is attached. Make two cuts on either side of the kernel to make three pieces of each mango. If the mango has an unusually large seed that doesn’t allow for slicing, peel the mango and reserve the skins. Add some water to the collected skins and squeeze out as much juice as you can. Strain and use the liquid in the curry. Heat the oil in a deep pan, kadhai or wok and sputter the mustard. 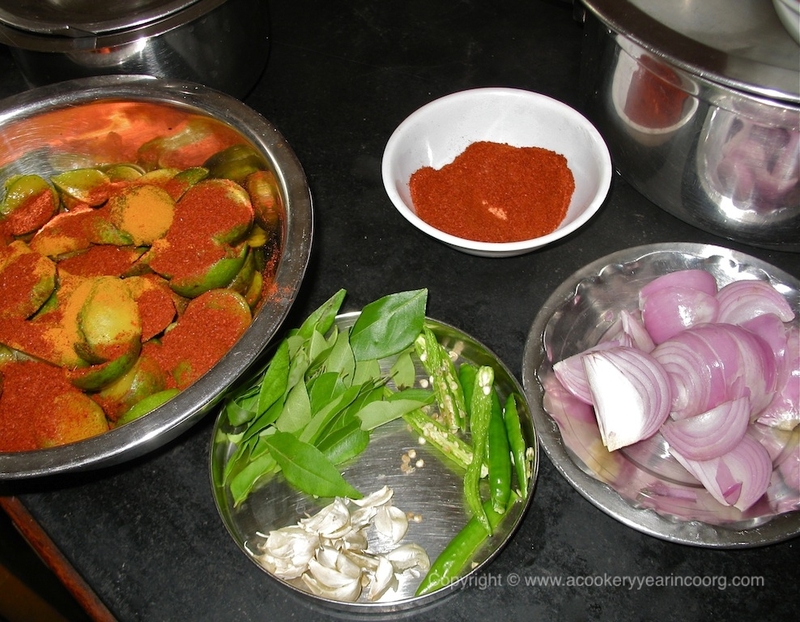 Put in the garlic and when it begins to brown, add the curry leaves and green chillies. Saute’ briefly, then add the onions and fry till they soften and just start to brown. Add the mangoes, turmeric, chilli powder and the ground roasted spices and stir to mix. Add 2 cups of hot water (or enough to cover the mangoes) and bring to a boil. Simmer for 5 minutes, then add salt and cook on medium heat for 10-15 minutes, or until the sauce has thickened and the mangoes are tender. Add the jaggery and simmer for a few more minutes. Check the sweet/sour balance. Best eaten with steamed rice. Follow the same recipe for pineapple curry.